Back in the 1980s and 1990s Amiga Public Domain shoot em ups were often a disappointment when compared to the commercial releases. Hellzone however was one of the few to break this trend with its very professional looking graphics and presentation. The game was released as shareware and only the first two levels were made available as a playable demo and released as public domain and appeared on the Assassin compilation disks. As you will see from the video, kindly provided by S2325 from EAB forum, Hellzone is a horizontal shoot em up which takes its inspiration from R-Type in terms of game play and the metalic graphics remind you of the Bitmap games of the time with the heavy use of blue and greys. The game play is nothing new, and it is the usual blast everything that moves and pick up power ups which are left behind when certain enemies are killed. Thankfully there is an energy bar for your ship so even the most inexperienced shoot em up gamer can survive for at least a few seconds before disappearing into a cloud of dust. Overall, if you enjoy Project X or R-Type you should have an enjoyable time playing this game. The game recevied very favourable scores in the Amiga Press when it was originally released, scoring 90% in CU Amiga, 77% in the One and 4/5 in Amiga Power. "As it was such a large undertaking to have commenced during University Study it's conception was fraught with poor design. The end result became slightly unwieldy & therefore released as was (kludged & not as great as it could have been)." Read more about the creators here. Similar to Hellzone, this was a game which was favourably received by the Amiga Gaming Magazines when it was originally released, obtaining 92% in the One and 5/5 in Amiga Power. For those of you who haven't heard of High Octane, it is an overhead racing game where you can either race against the computer or another human player. The game is similar to Super Cars in that you can drop mines and fire missiles to help you win the race. The game oozes class from the start with a very professional intro which sets the scene for the game which you should be able to watch in the video above which was kindly made by S2325 from the EAB forum. Thankfully the programming team still had some time after creating this intro to create additional tracks so that the player has a choice of three tracks to race on rather than being limited to just one track. The tracks are quite large and contain objects which impact on the performance of your car such as broken glass and road blocks. The computer controlled oponents provide a solid challenge for the player but this game really comes to life in two player mode. There are gas stations located on the race course for your car to visit to repair damage to extend the length of the challenge and seek revenge on your opponent. The game is viewed in a split screen beneath which is a report on the damage both cars have suffered. There is also a map, which shows the location of both cars which is useful when planning your attack. Overall a wonderful game which continues the spirit of the classic 16 Bit racing games Super Cars and Micro Machines. Download Game: This game can be found on our top 100 download page. This game received mixed reviews when originally released, obtaining a low 40% in CU Amiga and being awarded Game of the Month in Amiga Action. You may wonder why I have chosen this game as our Game of the Month when both Hellzone and Hi Octane both received high scores in all the magazines during their release. The reason is that Hydrozone took risks and tried something new. Both Hellzone and Hi Octane took popular games of the time (R-Type + Super Cars) and produced very professional public domain versions. Hydrozone whilst it could be argued shares some similarities with the Death Star scene from the Vector arcade version of Star Wars did try to produce something new and original. It is this bravery which still makes the game fresh and engaging after all these years. The game is a simple concept, guide your ship through the on coming maze by moving over or under the approachin walls and yet the game become almost hypnotic as you glide through the course. The speed the obsticles approach and the position of the walls make this challenge harder than you think and this is the key to the game play as you always feel you can do better and therefore you soon find yourself having another go, followed by another and then another. The programmer of HydroZone, David Cruickshank, has also worked on updating the game and has recently released a full amended version of the game which is available for download here. 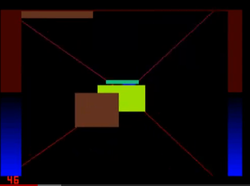 The video shown above was made by the programmer and shows the game running on an emulated Amiga under the Amiga 4000 settings. The game works fine on both the Amiga 500 and 1200 however on the Amiga 500 gamers will find that they see less walls in front of them, with the screen displaying 5 instead of the 8 shown on the more powerful machines. If you enjoyed this game check out our interview with the DJ Cruickshank as you may also enjoy the other games he wrote for the Amiga.